Although the Teutonic Knights had not come into contact with the Lithuanians until 1242, except in Kurland, already their organization of frontier defense in Prussia showed they were aware that the Lithuanians would most likely come to the aid of those tribes which were already conquered by the crusaders. This defensive system was the model that the Teutonic Knights used in Prussia in establishing their frontier toward Lithuania: a line of frontier castles — along rivers wherever possible — and behind that the forts which provided refuge for the native inhabitants when invasion threatened, and on the major rivers the small cities of foreign merchants and artisans where the major convents of knights were stationed. The frontier castles were not expected to intercept raiders, but only to warn the communities of the interior that the enemy was coming. The militia was to gather at the castle until sufficient numbers were present to fight, and then the heavily armed knights would lead them in pursuit. If the foe had columns of prisoners or droves of cattle and horses, they could not escape quickly and the defenders could count on overtaking them. A fierce battle often resulted. Unfortunately we have no reports of the military actions on the eastern frontier. The only two examples of frontier defense from this era are from Culm. In 1242 Duke Svantopolk of Pomerania raided across the frozen Vistula and was defeated by the garrison from Culm. No details were given. The next year Duke Svantopolk added a large force of Sudowians to his army, Prussians who came from the frontier of Lithuania. Confident in his numbers, he rode up to the walls of Culm and reviled the citizens who watched him. When he moved away, the garrison followed them cautiously, waiting for an opportunity to attack. Svantopolk gave them such an opportunity when he crossed a swamp with a ford so narrow that only a few men at a time could use it. The experienced former Marshall of the order urged an attack on the rear guard. The new marshall, however, wanted to recover the booty and took the army around the swamp by a different route where he fought the entire force of the enemy and was defeated.6 These tactics are similar to those followed in Livonia and doubtless were the same as those followed on the frontier toward Lithuania. The Teutonic Knights held the eastern defensive line for less than two years. Until 1237 they had conquered only the territory of Culm, which was in the bend of the Vistula river and surrounded on three sides by Christian lands — Masovia, Kujawia, and Pomerania — which provided many crusaders to assist in the conquest. The order had only four castles — Culm, Thorn, Rehden, and Marienwerder. In that year the Count of Meissen came on crusade and built two large ships, the Pilgrim and the Pacifier. These ships made possible a new strategy, a strategy more like that followed in Livonia. Now the crusaders could move easily and safely up the major rivers and waterways, avoiding the difficulties of land travel where ambush was always a danger. They established new castles and supplied them safely, and from the castles they raided the surrounding countryside until the natives surrendered and accepted baptism. Duke Conrad of Masovia and his son, Casimir of Kujawia, had a close alliance with the Teutonic Knights. Already they gotten much from the crusaders. Their lands were no longer plundered by Prussian attacks, and they held provinces of Dobrin and Plock. 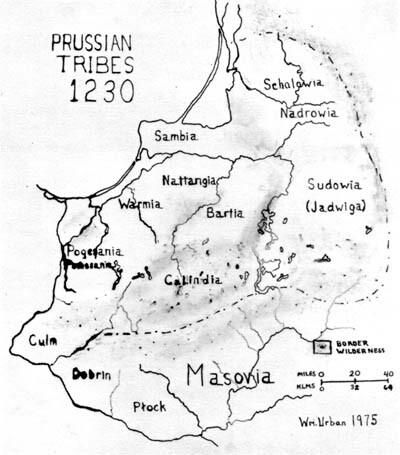 They expected to receive the territory of Jadwiga to the Northeast of Masovia.10 But at this moment they were not able to push into that region. In 1241 the Tatars had burst into Poland, had defeated a Polish army near San-domir, had gone on to burn Cracow and to annihilate the army of the duke of Silesia. Conrad and Casimir had to see to their southern defenses and, if possible, seize the distracted provinces for themselves. Conrad had always wanted to be a king of Poland. Now was his best chance since 1227, when his brother died and left the throne to a child. These complications in Poland meant that the Teutonic Knights had no help in Prussia in 1241 and 1242. This gives us the complete picture of the defense system. The line was to stretch along the Pregel and Alle rivers to the rough ground that formed the southern frontier with Masovia. By 1242 it had not reached that far east yet, but it was not far distant. Balga, Kreuzberg, Bartenstein, Schippenbeil, and Rössel form a straight line northwest to southeast from the sea to the lake district. The new system was not given an opportunity to prove itself in the less than two years that the Teutonic Knights held the region. The conquerors established a few markets and built at least one mill, but they probably built few bridges or roads and no dikes at all before the natives rose in 1242 and drove them away. All the frontier castles except Elbing and Balga were lost or abandoned. Thus the first defensive line toward the east collapsed without ever being attacked by Lithuanians. The later defensive lines of the fourteenth and fifteenth centuries hardly extended further east than the first one had reached. The Teutonic Knights occupied Sambia and built castles up the Memel river for a considerable distance. But rather than prove how great the ambitions of the Teutonic Knights were, it demonstrates how limited their plans were. They wanted to annex Samogithia, and thereby unite the Livonian and Prussian parts of their domains. That was a military necessity, they thought, because winter ice and storms made travel to Livonia by sea impossible half of each year, during which time Livonia was completely isolated and therefore vulnerable to attack. Samogithia was a reasonable goal considering the limited number of knights available to the order. All of Lithuania would have been impossible to garrison and defend. There was barely sufficient money to maintain the present forces in the Holy Land, in Prussia, and in Livonia. The Teutonic Knights had an important base near Acre that they were fortifying against an expected attack (which came in 1244) .21 A few years earlier they had given up Estonia rather than quarrel with the Danish king.22 They had not properly supported those crusaders who tried to conquer Novgorod in 1241 and 1242.23 The Teutonic Knights seem to have had limited land reasonable goals in mind, goals they were not far from achieving. In order to maintain themselves in even the lands they already had conquered, the Teutonic Knights had to develop a sound economic system they could tax. As we have seen, the attempts to do this in Prussia by establishing demesne farming had provoked the natives to revolt. They were hardly in a condition to press ahead rapidly with an attack on Lithuania. The Teutonic Knights had barely succeeded in conquering the Prussians when they had so many advantages. They were far less likely to succeed against the Lithuanians, where they had no powerful Christian allies, where there were no cities to capture, and almost limitless forest and swamp provided refuges from which the pagans could fight against the most overwhelming forces. The reputation of the Teutonic Knights as insatiable, land-hungry aggressors was firmly fixed in the public mind by Polish historians after the Teutonic Knights annexed Danzig in 1309, and was reinforced by the imperialism of the Second and Third Reich. This makes it difficult to evaluate objectively the ambitions of an earlier generation of crusaders, even though the documents reveal a much different story than that told by later propagandists. The sources show a crusading organization that made war fiercely and defended its rights tenaciously, but also a leadership that had realistic goals and that sought to achieve these by working with the neighboring Christian princes. Even the limited ambitions mentioned above were not sacred. In 1257 at the height of their military success, when the pagans in Samogithia were almost beaten, the Teutonic Knights granted them a truce of two years in the hope that they could be converted peacefully.25 That meant that the new converts would not be subjects of the Teutonic Knights, but become an independent state like Lithuania had become. Three years earlier the Teutonic Knights had divided Jadwiga (Sudowia) with their Polish and Russian allies, each taking one-third. The third of the order was presumably that region in the bend of the Memel river. The river made a natural defense line, and bordered then-hostile Samogithia on the south.26 This area was promised to King Ottokar of Bohemia in 1264, along with other territories to the south, if he would come on crusade.27 That would have left the Teutonic Knights with a strictly limited territorial possession, with no possibility for future expansion — but also without the necessity to provide an expensive frontier defense. Therefore we may conclude that the defensive line of 1242, with the ambition to occupy also Sambia and Samogithia to provide a land route to Livonia, was the final frontier line envisioned in the mid-thirteenth century by the leadership of the Teutonic Knights, and not as an interim frontier that would in time extend deep into the interior of Europe. * On Fulbright Research Grant at the Herder Institut, Marburg, West Germany. Hirsch, Max Toppen, and Ernst Strehlke. 6 volumes. Leipzig: Hirzel, 1861 - 1874). See particularly Petri de Dusburg, "Cronica terre Prussie," in volume 1, pp. 53 - 55; also the Christburg treaty of 1249 in volume 1, part 1 of Preussisches Urkundenbuch (ed. Rudolf Philippi. Knigsberg: Hartung, 1882), pp. 158-165; a good modern summary is Christian Krollmann, Das Religionswesen der alien Preussen (Königsberg: Bruno Meyer, 1927). 2 Livlandische Reimchronik (ed. Leo Meyer. Paderborn: Ferdinand Schöningh, 1876), pp. 43-47; the best account is Friedrich Benninghoven, Der Order der Schwertbrüder (Köln - Graz: Bohlau, 1965). 3 Livlandische Reimchronik, pp. 57 - 62. 4 Liv-, Est-, und Curlandisches Urkundenbuch, vol. I (ed. (Friedrich Georg von Bunge. Rėvai: Kluge und Ströhm, 1833), pp. 223-226; William Urban, "The Organization of the Defense of the Livonian Frontier in the 13th Century," Speculum, 48 (July, 1973), 525-532. 5 Livlandische Reimchronik, p. 56. 6 Petri de Dusburg, pp. 69, 73; Nicolaus von Jeroschin, "Kronike von Pruzinlant," Scriptures rerum Prussicarum, I, 370 -371; for a detailed history of this era consult Johannes Voigt, Geschichte Preussen von den altesten Zeiten bis zum Unter-ange der Herrschaft des Deutschen Ordens (12 vis. Königsberg: Borntrager, 1827-1830) and Albert Ewald, Die Eroberung Preussen durch die Deutschen (4 volumes. Halle: Waidenhausen, 1872 -1886. 7 Petri de Dusburg, pp. 60 - 65. 8 Erich, Machke, Der Deutsche Orden und die Preussen, Bekeh-rung und Unterwerfung in der preussisch -. baltischen Mission des 13. Jahrhunderts (Berlin: Emil Eberling, 1928); for the work of the papal legate present in Prussia and Livonia at this time see Gustav Adolf Donner Kardinai Wilhelm von Sabina (Helsingsfors: Tilgmann, 1928). 9 Petri de Dusburg, p. 65; Voigt, Geschichte Preussens, II, 402-408. 10 The Polish Duke, Conrad of Masovia, was the most important figure in the first two decades of the crusade. At the beginning of the century he received Masovia and Kujawia when his brother inherited Krakow, Little Poland, and Samdomir. They worked harmoniously together, making numerous cam-paigns into Russia and Prussia. He took up the crusading efforts of past Polish kings by supporting Bishop Christian's mission to Prussia. Only in 1224, after all military expeditions had failed and the pagans were making deep raids into Masovia did he invite the Teutonic Knights to aid him. He gave the Teutonic Knights lands around Culm, but he also established a crusading order in Dobrin and gave the Hospitallers lands. The Templars and the Spanish Order of Calatrava were settled not far away. Of these several orders only the Teutonic Knights had the resources and the interest to make a success of their opportunities and Duke Conrad gave them his full support. In 1235, when the Dobriner Order was absorbed into the Teutonic Knights, he received those lands back, and he was able to establish a bishopric in Plock, but he had to ask the Teutonic Knights to garrison the castles in these regions. The 1237 treaty of defense was extended in 1240 to an alliance against Duke Svantopolk, who had killed his brother in battle in 1227. In the 1240's Duke Conrad expanded into Jadwiga, that border region south of Prussia, lying between Masovia, Lithuania, and Wolhynien. For a good political biography, see Bronislaw Wlodarski, "Polityczne Plany Konradą I księcia Mazowieckiego" Rocznik Towarzyskwo Naukowe w Toruniu, 76(1971), #1. 11 Preussisches Urkundenbuch, p. 105. 12 Ibid., pp. 108 -109. 13 Friedrich Gerg von Bunge, Livland, die Wiege der deutschen Weihbischofe (Leipzig: Bidder, 1875). 14 See the Christburg Treaty. Preussisches Urkundenbuch, pp. 159 -160. 15 Frances Ludwig Carstens, The Origins of Prussia (Oxford: Clarendon Press, 1954), pp. 65f. 16 Petri de Dusburg, pp. 66-69. 17 Johannes Totoraitis, Die Litauer under dem Konig Mindowe bis zum Jahre 1263 (Freiburg/Schweiz: St. Paulus, 1905), pp. 82 - 84. 18 Liv-, Est-, und Curlandisches Urkundenbuch, pp. 223 - 226, 237 - 238. 20 Ibid., pp. 333 - 334; to understand Mindaugas' reasoning, one must go past the 1253 document requiring the Teutonic Knights to aid him against his enemies to the Wolhynien chronicle which explains who these enemies were. This chronicle is used extensively by Totoraitis. See also Zenonas Ivinskis, "Mindaugas und seine Krone," and Manfred Hellmann, "Der Deutsche Orden und die Königskronung des Mindaugas," both in Zeitsehrift fur Ostforschung, 3(1954). 21 Walther Hubatsch, Montfort und die Bildung des Deutschor-densstaates im Heilingen Lande, #5 of the 1966 series Nachrichten der Akademie der Wissenschaften in Göttingen (Gottingen: Vandenhoeck und Ruprecht, 1966). 22 Liv-, Est-, und Curländisches Urkundenbuch, I, 205 - 308; Benninghoven, Der Orden der Schwertbrüder, pp. 362 - 369. 23 Livländische Reitnchronik, pp. 50 - 52; Benninghove, Der Or den der Schwertbrüder, pp. 369 - 382. 24 Peter Goetze, Albert Suerbeer, Erzbischof von Preussen (St Petersburg: Graff, 1854). 25 Livländische Reimchronik, pp. 105-106; the Samogithian territories the Teutonic Knights hoped to acquire are listed in two documents of 1253 and 1257. If these are fakes, then the argument is even stronger that these represent the greatest ambition for land acquisition held by the leadership of that time. Preussisches Urkundenbuch, I, 2, pp. 33-35; the grant Selonia falls in the same category, but concerns only a great border wilderness. Liv-, Est-, und Curländisches Urkundenbuch, I, 371 - 372. It is doubtless a fake of a later date. 26 Preussisches Urkundenbuch, I, 1, pp. 221 - 222. 27 Ibid., I, 2, pp. 166-167, 192. 28 Ibid., I, 1, pp. 239-240; I, 2, pp. 146-149. 29 Even after the loss of the Holy Land in 1290, the Teutonic Knights hoped to return there. The Grandmaster lived in Venice for almost two decades so he could follow events in the Near East more closely. Only when these hopes dimmed, and the order was shocked by the shameful dissolution of the Templars, did the leaders commit themselves solely to expanding their Prussian domains. When they unexpectedly had the opportunity to occupy the lands around Danzig and make themselves militarily and economically secure, they could not resist. At the time it seemed justified, but in retrospect it was a terrible misjudgment of the situation.